Product #1205 | SKU 496RC2 | 5.0 (based on 1 rating) Thanks for your rating! 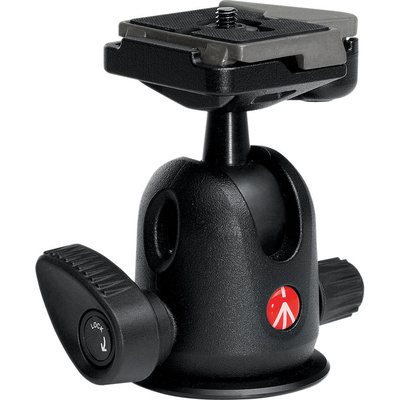 The Manfrotto 496RC2 Compact Ball Head RC2 Quick Release with 200PL-14 Quick Release Plate is constructed of die-cast aluminum, strong enough to support SLR or DSLR cameras with a medium lens, and light medium format cameras. It has a single repositionable locking lever for 360° panoramic rotation, ±90° tilt movement, plus a friction control for precise positioning. Cameras are attached to the ball head with the 200PL-14 Plate with 1/4'' male threads. The head to tripod attachment has 3/8'' female threads. Additionally, the Quick Release has a safety system to prevent an accidental detaching from the head.